Eicosapentaenoic acid and docosahexaenoic acid, the two main omega (ω)-3 fatty acids, have therapeutic and beneficial health effects (Figure 1). Recently these essential long chain polyunsaturated fatty acids (LC-PUFAs) have received increased attention in both human and animal nutrition [1,2]. Currently, the principal source of EPA and DHA for human consumption is fish and fish oil. However, marine fish stocks are in severe decline as a result of increased demand for EPA and DHA and decades of over-fishing . In recent years, several methods have been applied to enrich ω-3 PUFA in fish oils as a way of increasing their concentrations. Several other methods such as interesterification and transesterification have been used to synthesize ω-3 PUFA in readily available natural phospholipids in edible oils at cheap cost. This chapter discusses the recent advances and breakthroughs in developing prospective alternative sources of omega PUFA (EPA/DHA). Microbial and plant sources of PUFA, their enhanced production using metabolic engineering, current ω-3 PUFA enrichment and production methods, limitations and safety concerns have also been discussed. 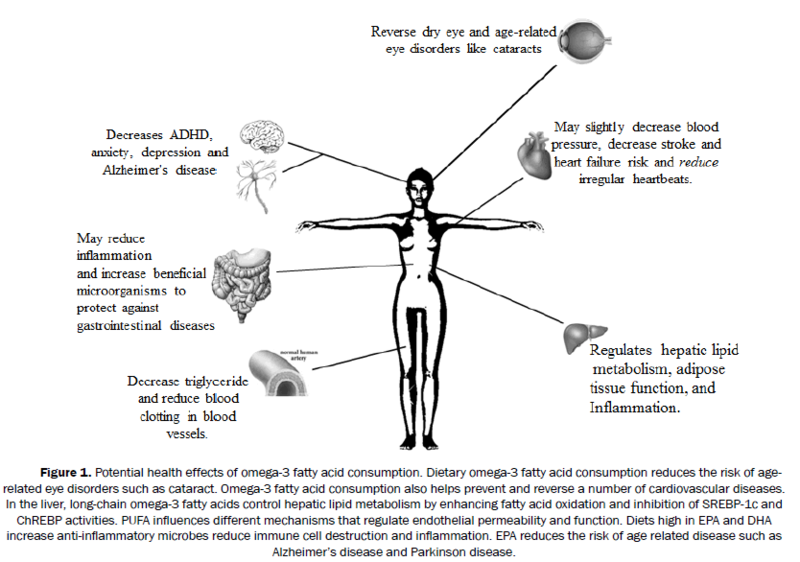 Figure 1: Potential health effects of omega-3 fatty acid consumption. Dietary omega-3 fatty acid consumption reduces the risk of agerelated eye disorders such as cataract. Omega-3 fatty acid consumption also helps prevent and reverse a number of cardiovascular diseases. In the liver, long-chain omega-3 fatty acids control hepatic lipid metabolism by enhancing fatty acid oxidation and inhibition of SREBP-1c and ChREBP activities. PUFA influences different mechanisms that regulate endothelial permeability and function. Diets high in EPA and DHA increase anti-inflammatory microbes reduce immune cell destruction and inflammation. EPA reduces the risk of age related disease such as Alzheimer’s disease and Parkinson disease. Over the past years, numerous studies conducted have concluded that the presence of LC ω-3 PUFAs in the human diet is required for beneficial health effects (Figure 1). Meanwhile, it is reported that, diets containing excessive amounts of ω-6 PUFAs or a very high ω-6/ω-3 ratio may be involved in promoting the pathogenesis of many diseases, such as cardiovascular disease, cancer, inflammatory and autoimmune diseases . On the contrary, increased levels of ω-3 PUFA (a lower ω-6/ω-3 ratio) is more desirable in reducing the risk of many of the chronic diseases such as obesity, cancer, type 2 diabetes and arthritis [5,6]. Despite the reports that consumption of omega-3 PUFAs may not lower cardiovascular risk, recent studies have shown the beneficial effects of low n-6/n-3 PUFA ratio on cardiovascular risk factors and the adverse effects of a high n-6/n-3 PUFA ratio [7,8]. In addition to cardiovascular benefits, ω-3 fatty acids have demonstrated positive effects on brain functions and the nervous system [9,10]. In pregnant women, adequate intake of EPA and DHA is essential for healthy development of the fetal brain [11,12]. Arachidonic acid (ARA) and DHA are also required for normal growth and functional development of infants . Consumption of LC ω-3 PUFAs have been shown to have therapeutic effects in conditions such as eczema, inflammatory bowel disease, metabolic syndrome, rheumatoid arthritis and cancer [10,14-19]. Despite reports on their posibility to cause cancer recent studies continue to loud the beneficial effects of EPA- and DHA-derived bioactive lipid mediators in treating diseases and promoting health [20-22]. ω-3 fatty acids DHA play vital roles in lowering blood pressure by activating large Ca2+ conductance and voltage-activated K+ (BK) channels which lead to vasodilation. However, DHA ethyl ethers found in most dietary supplements fail to activate the ion channels and may even antagonize the positive effect of DHA . However, there is evidence that DHA and EPA are involved in the neuronal repair process after traumatic brain injury (TBI) . Although both animal models and human studies on brain injuries support their therapeutic effects, there has been no clinical trial evaluation on the effects of ω-3 fatty acids on resilience to, or treatment, of TBI . A study conducted to assess clinical and biochemical effects of targeted alteration in dietary ω-3 and ω-6 fatty acids for treating chronic headache showed that dietary intervention reduced pain in the head, altered antinociceptive lipid mediators, and improved quality-of-life of patients . However, some studies have shown a relationship between high α-linolenic acid (ALA) intake and an increased risk of prostate cancer irrespective of the source of the fatty acid [19,26]. Meanwhile, a systematic and meta-analysis of previous meta-analysis studies on the association between ALA and risk of prostate cancer revealed no evidence linking ALA consumption to prostate cancer yet studies that used blood or tissue markers observed that higher ALA concentrations were present in serum/ tissues of prostate cancer patients [27,28]. Other studies however suggest a slight protective ability of ALA against prostate cancer making the contribution of ALA consumption to prostate cancer very controversial. Mammals inefficiently covert ALA into EPA and DHA, yet a study on the effects of flaxseed supplementation in prostate cancer patients reported higher EPA levels in there and or prostatic tissue after consumption [29,30]. This observation suggests that ALA might have been effectively converted to LC PUFA in the patients and the conversion may not be as rate-limiting as previously thought. Their findings suggested that flaxseed may have protective effects against prostate cancer. Investigations about the effect of fish consumption on prostate cancer outcome have shown contradictory findings. While some showed a reduced risk of prostate cancer with high fatty fish intake others reported an inverse association for particularly high lean fish intake [31-34]. However, although different fish sources may be of importance, differences in cooking methods may explain the mixed findings. It is possible that eating fish cooked at high temperatures could increase risk of advanced prostate cancer . Other studies found no association between overall fish consumption in early or midlife and prostate cancer risk in a population with uniquely high intake of lean fish. Instead, they found that salted or smoked fish may increase risk of advanced prostate cancer due to the possible formation of carcinogens at higher temperatures, whereas fish oil consumption could offer protection against prostate cancer progression in elderly men. When oily fish is cooked at high temperature, high amounts of carcinogens such as heterocyclic amines (HCAs) and polycyclic aromatic hydrocarbons (PAHs) are rapidly formed with time and this increases the risk of advanced prostate cancer . In addition to the formation of mutagens, alterations in fish lipid fractions due to oxidation of unsaturated fatty acids and cholesterol, absorption of culinary fat, the type of oil used for cooking whether animal fats or plant-based oils/fats rich in ω-6 PUFAs or oils rich in ω -3 PUFAs fatty acids could also possibly influence prostate cancer risk . Moreover, a phase II clinical trial in a cohort of 48 untreated men affected with low-risk prostate cancer, found that EPA consumption could reduce the rate of prostate cancer progression . Thus, prostate tissue ω-3 fatty acids, especially EPA, may be protective against prostate cancer progression in men. However, cancer is a complex disease and all nutrients can be harmful in deficiency or excess, and thus more studies are needed to explain completely contrasting results. Studies have found that many people do not consume enough LC ω-3 PUFA for optimal health . Dietary recommendations for ω-3 fatty acids and fish have been stipulated by different organizations and health authorities (Food and Agriculture Organization (FAO), World Health Organization (WHO) and countries (Table 1). These recommended intakes can be achieved by consuming oily fish and seafood to increase LC ω-3 PUFA levels. An alternative to increasing fish/seafood consumption is to consume fish oil supplements and or micro-algal EPA/DHA capsules which are considered safe [38,39]. Although, the Food and Drug Administration (FDA) stipulates that dietary supplements should not recommend or suggest in their labeling a daily intake exceeding 2 grams of EPA and DHA, latest evidence suggests that EPA+DHA doses ≥ 2 g/day are required to achieve significant lowering effects on plasma triglyceride (TG), and that little or no effect may be observed at the recommended EPA and/or DHA intakes of 200–500 mg/day . The European Food Safety Authority (EFSA) also recommends a minimum intake of EPA+DHA of 250 mg in adults, a DHA intake of 100 mg specifically for infants and young children (≤24 months) and an increase in DHA intake of 100–200 mg for pregnant and lactating mothers. The EFSA (Authority 2010) further states the consumption of a wide range of fish species (two servings per week, preferably one oily). EPA+DHA doses up to 5 g/day, EPA, and DHA alone up to 1.8 g/day and ca. 1 g/ day, respectively, are safe for adults, according to a recent EFSA opinion on tolerable upper intake . Another option is the consumption of foods enriched with LC ω-3 PUFA. Nonetheless, the taste and smell of fish oil in their natural state is not liked by many consumers. In addition, fish oil is not suitable for vegetarians and the odour makes it unattractive. However, this problem of lipid oxidation in fish oil can be minimized by microencapsulation . Alternative sources of ω-3 LC-PUFA can be krill oil, calamari oil, microorganisms and genetically modified crops and livestock. Omega-3 LC-PUFAs from these sources have also been demonstrated to be safe and of good bioavailability . Table 1. Recommendations for EPA and DHA intake. World Health Organization (WHO) Authoritative Body General adult population n-3 PUFAs: 1-2% of energy/day Amine et al. International Society for the Study of Fatty Acids and Lipids (ISSFAL) Expert Scientific Organization General adult population for cardiovascular health ≥ 500 mg/day of EPA+DHA Cunnane et al. Pregnant/Lactating Women DHA: 200 mg/day Koletzko et al. World Association of Perinatal Medicine Working Group Pregnant and Lactating Women 200mg DHA/Day Koletzko et al. Although a variety of alternative EPA and DHA sources such as bacteria, fungi, plants and microalgae are currently being explored for commercial production, microalgae remains the initial producers of EPA and DHA in the marine food chain. They can naturally grow fast under a variety of autotrophic, mixotrophic and heterotrophic culture conditions with high LC ω-3 fatty acid production potential. Strains from the genera Phaeodactylum, Nannochloropsis, Thraustochytrium and Schizochytrium have demonstrated high accumulation of EPA and/or DHA . Microalgae are rich in phytosterols, carotenoids, vitamins and antioxidants. Phytosterols have proven cholesterol lowering efficacy whereas carotenoids act as antioxidants and some have vitamin A activity, and protect against some chronic illnesses. These components may contribute to the health benefit of microalgal ω-3 LC-PUFA oils [49,50]. Metabolic engineering: Metabolic engineering, a technique of optimizing genetic and regulatory processes within cells to increase the production of a target substances, is another promising approach to increase the production of ω-3 fatty acids. PUFA biosynthesis pathways in eukaryotes and marine bacteria have been shown in (Figure 2). Figure 2: Schematic representation of aerobic LC-PUFAs biosynthesis. The predominant Δ6-pathway for the synthesis of omega-6 and omega-3 VLC-PUFAs is shown, as is the alternate Δ8-pathway. The two routes for DHA synthesis, microbial Δ4-pathway and mammalian “Sprecher” pathway are shown . The first to report the metabolic engineering of the omega-trait in transgenic algae. 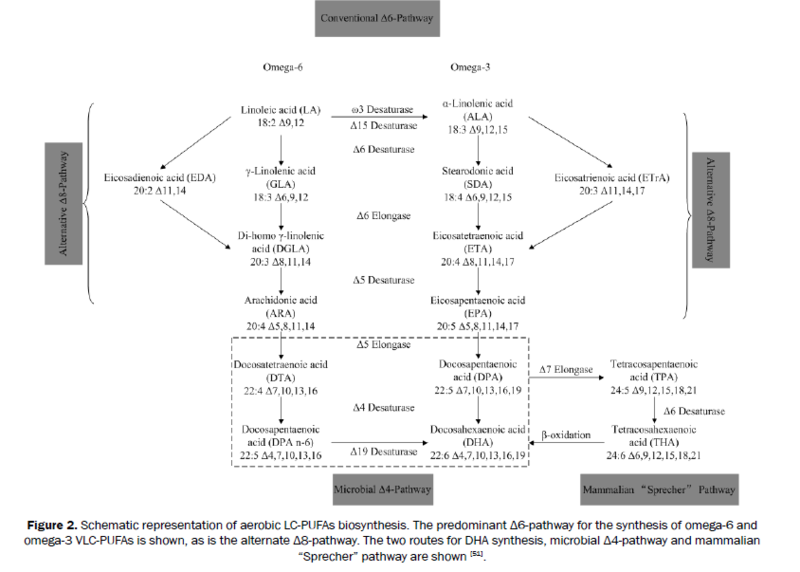 They overexpressed heterologous genes encoding enzymes of the LC-PUFA biosynthetic pathway in Phaeodactylum tricormutum to enhance the production of DHA and DPA . The transgenic strain (Pt_Elo5) was found to accumulate high levels of EPA (12.8% incorporated in neutral lipids) when grown in raceway ponds and this shows its feasibility for commercial EPA and DHA production . Many microalgae and fungi have been engineered to overproduce LC-PUFA (Table 2). Table 2. Genetic engineering studies to improve PUFA yields in microorganisms. Mortierellaalpina 1S-4 NR 44 Sakuradaniet al. Aspergillussp NR NR Sakuradaniet al. Yarrowialipolytica NR 56.6 Xueet al. Cloning of genes involved in EPA and DHA biosynthesynthetic pathways from marine bacteria has been a subject of intensive research over the last decade. Transgenic E. coli has been shown to produce 6.1 times more EPA compared to the marine bacterium Shewanella baltica MAC1. Also, expressing the S. baltica MAC1 EPA/DHA gene cluster into Lactococcus lactis subsp. cremoris MG1363 yielded high levels of EPA and DHA. To the best of our knowledge, these authors are the only research group to generate an EPA/DHA-producing lactic acid bacterium, which can be used as an alternative for fish and fish oils as most LAB strains are food-grade microorganisms used widely for fermented food, particularly the dairy industry. The genetic manipulation of LAB (GM-LAB) will have several potential applications in the development of improved dairy products. Meanwhile, the safety issues on genetically modified LAB must be bridged . Moreover, the extracted and purified EPA/DHA from the overexpressed GM-LAB could be more acceptable than the live cells. However, perception remains the greatest challenge to overcome once the evidence to allay safety concerns is available. A major breakthrough has been the recent success in engineering oleaginous yeast Y. lipolytica to produce high concentrations of ω-3 fatty acids. This remains the highest among the currently known non-animal EPA producers and makes land-based commercial production of EPA possible. Lower plants such as liverwort have also been engineered to produce large amounts of ARA and EPA from linoleic and alpha-linolenic acids. For instance, overexpressing Δ6-elongase, Δ6-desaturase, and Δ5-desaturase genes in Marchantia polymorpha L. resulted in a 3-fold increase ARA while EPA increased by 2-folds relative to wild type. Introduction and coexpression of the three genes in tobacco resulted in an increased production of ARA (15.5% of total fatty acids in the leaves) and EPA (4.9% of total fatty acids in the leaves). Also, introduction and coexpression of the three bryophyte genes in soybean resulted in the accumulation of high levels of C20-LC PUFAs (19.5% of the total fatty acids in the seeds). This suggests how the bryophyte may serve as a source of important genes required to boost C20-LC PUFA production in transgenic plants. Although higher plants have the enzymatic complex to synthesize the linoleic acid (LA) and α-linolenic acid (ALA), only few plants have the ability to produce Δ6-desaturated fatty acids, for example Stearidonic acid (SDA) and predominantly gammalinolenic acid (GLA). However, higher plants do not possess the enzymes to follow the elongation and desaturation steps to produce LC ω-3 PUFA as shown in (Figure 2). Despite inefficient conversion of ALA to SDA, SDA has a potential as an EPA-enhancing fatty acid, by bypassing the rate limiting enzyme Δ6-desaturase through their supplementation compared to ALA rich diets . Other researchers have also successfully expressed Mortierella isabellina delta 6-fatty acid desaturase gene into Nicotiana tabacum cv. xanthi using the vector pGAMICL6 to produce a high yield of GLA . The introduction of the LC-PUFA biosynthetic pathways into oilseed crops has been successfully demonstrated. High yields of GLA (27.067% of the total fatty acids) were obtained by heterologous expression of Mortierella isabellina delta6-fatty acid desaturase gene in five soybean cultivars . Also, expression of the Pythium irregulare desaturase gene PiD6 in Brassica juncea under the control of the Brassica napus napin promoter resulted in the synthesis of high levels of GLA (40% of the total seed fatty acids). Meanwhile, though oil seeds can be engineered for high LC-PUFA production, reaching economically viable levels has been challenging . Further studies are needed to better understand the enzymes and genes involved in seed oil biosynthesis to help circumvent the limitations on the production of unusual fatty acids such as triacylglycerol containing mono and di-hydroxy fatty acids (ricinoleic and auricolic acids). Transgenic technology has been applied in generating omega-3 livestock such as transgenic omega-3 pigs. This may provide an alternative and sustainable land-based source of omega-3 fatty acids which can preserve and protect already deteriorating marine life and resources . Dietary supplementation of long-chain PUFA is hindered because these fatty acids are present in low concentrations in the commonly available edible oils. Most fish oils do not contain high levels of DHA while microbial oils which contain high levels of either DHA or EPA are produced at a high cost. Hence, two main strategies have been developed to concentrate omega-3 PUFA in oils in the form of triacylglycerol. The first method mainly relies on the physical property differences between omega-3 fatty acid moieties and non-omega-3 fatty acid moieties in the oil. Such methods include urea complexation, supercritical fluid extraction, and low-temperature crystallization. In urea complexation, alkaline hydrolysis of the oil triacylglycerol is carried out using alcoholic KOH or NaOH and the free fatty acids are mixed with an ethanolic solution of urea for complex formation. The mixture is cooled and filtered to remove the crystallized urea complexes leaving the enriched omega -3 PUFAs . This method is the simplest and efficient for obtaining ω-3 PUFAs concentrates in the form of free fatty acids . Supercritical extraction technology involves the use of carbon dioxide as the solvent for separating ω-3 PUFAs from other components in oil. The selectivity of this method is based only on the number of carbons in a chain but independent of the number of double bonds . This method is environmentally friendly and produces products without residual solvents . Low-temperature crystallization separates oil components based on their solubilities. Longchain saturated fatty acids with higher melting points crystallize at low temperatures so that PUFAs are separated as liquid form. This process can be carried out in the presence or absence of special solvents . Despite the simplicity of procedure and its low cost, there is no significant increment in the omega-3 PUFA contents. The second method involves lipase-catalysed reactions that result in modifications of fatty acids on their glycerol backbone within the fat and oil. These enzymatic reactions result in the synthesize n-3 PUFA-enriched TAGs. The enzymatic reactions include interesterification, and hydrolysis and re-esterification. Interesterification is a chemical reaction that induces the rearrangement of fatty acids within and between triacylglycerols. This reaction results in an alteration of thermal behavior, and polymorphism of triacylglycerols which in tend influence fat crystal network structure, texture, and rheological properties, all of which contribute to functionality. For instance, interesterification of high oleic sunflower oil and tripalmitin or tristearin catalyzed by Thermomyces lanuginosus lipase resulted in products with reduced saturation as well as broader melting profiles . Interesterification is associated with three reactions namely; acidolysis, alcoholysis and transesterification . In the food industry, interesterification of fats and oils is carried out using enzymes (lipases) or chemical catalysts (usually sodium methoxide). The fatty acid composition of tuna oil was successfully enriched with to achieve an EPA: DHA ratio of 1:4 using sodium methoxide as a catalyst . Though chemical interesterification comes with a low processing cost, there is a high processing loss due to oil saponification. On the other hand, enzymatic interesterification though relatively expensive, results in minimal processing loss and the products retain their oxidative stability. The substrate specificity of lipases also enhances selective formation of good-quality products . Lipase hydrolysis has been used for enriching total ω-3 fatty acids or for selectively enriching either DHA or EPA in fish oil. Because the materials that are enriched in long-chain ω-3 are usually either partial glycerides or free fatty acids, the materials are re-esterified to triglycerides using lipase. By this method, the total ω-3 fatty acids in fish oil were increased from 30% in feed oil to 45% in the partial glycerides. Addition of Candida rugosa lipase selectively increased the DHA:EPA by 5:1 . Transesterification involves the transformation of an ester into another through interchange of the alkoxy moiety and this method has been employed in producing ω-3 PUFA ethyl esters. For instance, ω-3 PUFA ethyl esters can be produced from menhaden oil and ethanol by transesterification using lipase K80 as a catalyst . ω-3 PUFA-enriched triacylglycerol has also been produced by a two-step enzymatic reaction involving a lipase (Novozyme 435) catalyzed transesterification and a mutant lipase (SMG1-F278N) catalyzed ethanolysis. The triacylglycerols were then purified using low temperature molecular distillation . Another way of obtaining EPA and DHA as phospholipids is by incorporating the fatty acids into inexpensive natural sources of phospholipids by enzyme-mediated transesterification . Many studies have focused on using enzymes to produce phospholipids with specific fatty acid compositions in order to develop products for specific nutritional or health purposes [84,85]. Phospholipids containing PUFA at the sn-1 position have been produced by phospholipase A2-mediated esterification of phosphatidylcholine (PC) and lipozyme-catalyzed acidolysis. Also, phosphotydylcholine containing PUFA at its sn-2 position was generated by phospholipase A2-mediated condensation of lyso-PC and PUFA in glycerol. n-3 PUFA was also incorporated into phosphatidylcholine using Mucor miehei lipase and phospholipase A2 as catalysts. Lipases are however often stimulated by the presence of divalent cations such as Ca2+ and Mg2+. Calcium ions act at the catalytic site of lipases by promoting polarization of the substrate ester carbonyl group and by stabilizing negatively charged intermediates during catalysis via water molecules. The presence of Ca2+ has been shown to enhance transesterification of soybean lecithin with methyl esters of EPA and DHA in hexane catalysed by R. miehei lipase. Though it is possible to produce omega-3–enriched food products with satisfactory shelf life and good sensory properties, their stability to oxidation depend on the composition of the food matrix. Therefore, different forms of omega-3 lipids such as neat oils, microencapsulated fish oil or as a fish oil-in-water emulsion can be added to foods depending on the food matrix [86-90]. Due to increased awareness of the health benefits of EPA and DHA, the demand for fish oil is increasing and the fish populations are in decline. However, recommendations to increase LC ω-3 PUFA intake should consider its potential health risks. Cooking methods also need to be considered since ω-3 PUFAs are easily oxidized resulting in harmful free radicals. Microalgae, the primary producers of omega-3 LC-PUFA could be a possible alternative, but the production cost of autotrophic microalgae is still rather high. Plant based equivalent of marine oil remains a challenge, because altering the composition of LC ω-3 PUFAs in seeds to obtain a fish oil substitute is the most pressing objective. Transgene-derived and extensive metabolic engineering of microorganisms producing LC ω-3 PUFAs have an important role in the sustainability of fish stocks. Engineering genes encoding EPA and DHA biosynthetic pathways into food grade microorganisms such as lactic acid bacteria and yeast can be used as sustainable and cost effective alternative source for fish oils, and yet modern technologies must be thoroughly evaluated. However, interesterification and transesterification will remain promising techniques of producing LC ω-3 PUFAs from cheap fatty acids. Since omega-3 PUFA may interact with other food ingredients in the food matrix, the impact of such interactions on the nutritional effects of omega-3 PUFA deserves further investigations. Kris-Etherton PM, et al. Fish consumption, fish oil, omega-3 fatty acids, and cardiovascular disease. Circulation. 2002;106:2747-2757. Burdge GC and Amiri PC. Conversion of alpha-linolenic acid to longer-chain polyunsaturated fatty acids in human adults. ReprodNutr Dev.2005;45:581-597. Amiri‐Jami M and Griffiths M. Recombinant production of omega‐3 fatty acids in Escherichia coli using a gene cluster isolated from Shewanella baltica MAC1. ‎J ApplMicrobiol. 2010;109:1897-1905. Lazic M, et al. Reduced dietary omega-6 to omega-3 fatty acid ratio and 12/15-lipoxygenase deficiency are protective against chronic high fat diet-induced steatohepatitis. PLoS One. 2014;9:e107658. Marangoni F and Poli A. n− 3 fatty acids: functional differences between food intake, oral supplementation and drug treatments. Int J Cardiol. 2013;170:S12-S15. Simopoulos AP. The importance of the omega-6/omega-3 fatty acid ratio in cardiovascular disease and other chronic diseases. ExpBiol Med. 2008;233:674-688. Rizos EC, et al. Association between omega-3 fatty acid supplementation and risk of major cardiovascular disease events: a systematic review and meta-analysis. JAMA. 2012;1024-1033. Yang LG, et al. Low n-6/n-3 PUFA ratio improves lipid metabolism, inflammation, oxidative stress and endothelial function in rats using plant oils as n-3 fatty acid source. Lipids. 2016;51:49-59. Hasadsri L, et al. Omega-3 fatty acids as a putative treatment for traumatic brain injury. J Neurotrauma. 2013;30:897-906. Riediger ND, et al. A systemic review of the roles of n-3 fatty acids in health and disease. J Am Diet Assoc. 2009;109:668-679. Ruxton CHS and Derbyshire E. Latest evidence on omega-3 fatty acids and health. Nutr Food Sci. 2009;39:423-438. Simopoulos AP and Bazan NG. Omega–3 fatty acids, the brain and retina. World Rev Nutr Diet. 2009;99:71-96. Innis S. Omega-3 fatty acids and neural development to 2 years of age: Do we know enough for dietary recommendations?J Pediatr Gastroenterol Nutr. 2009;48:S16–S24. Abeywardena MY and Patten G. Role of ω3 longchain polyunsaturated fatty acids in reducing cardio-metabolic risk factors. EndocrMetab Immune Disord Drug Targets. 2011;11:232-246. Oelrich B, et al. Effect of fish oil supplementation on serum triglycerides, LDL cholesterol and LDL subfractions in hypertriglyceridemic adults. NutrMetabCardiovasc Dis. 2013;23: 350-357. Torfadottir JE, et al. Consumption of fish products across the lifespan and prostate cancer risk. PloS one. 2013;8:e59799. Moreel X, et al. Prostatic and dietary omega-3 fatty acids and prostate cancer progression during active surveillance. Cancer Prev Res (Phila). 2014;7:766-776. Brasky TM, et al. Plasma phospholipid fatty acids and prostate cancer risk in the select trial. J NatlCancer Inst. 2013;105:1132-1141. Brouwer IA, et al. Dietary α-linolenic acid is associated with reduced risk of fatal coronary heart disease, but increased prostate cancer risk: a meta-analysis. J Nutr. 2004;134:919-922. Lorente-Cebrián S, et al. An update on the role of omega-3 fatty acids on inflammatory and degenerative diseases. JPhysiol Biochem. 2015;71:341-349. Schwanke RC, et al. EPA-and DHA-derived resolvins' actions in inflammatory bowel disease. Eur J Pharmacol. 2015;785:156-164. Souza PR and Norling LV. Implications for eicosapentaenoic acid-and docosahexaenoic acid-derived resolvins as therapeutics for arthritis. Eur J Pharmacol. 2015;785:165-173. Hoshi T, et al. Omega-3 fatty acids lower blood pressure by directly activating large-conductance Ca2+-dependent K+ channels. ProcNatlAcad Sci. 2013;110:4816-4821. Dyall SC. Long-chain omega-3 fatty acids and the brain: a review of the independent and shared effects of EPA, DPA and DHA. Front Aging Neurosci. 2015;7:52. Ramsden CE, et al. Targeted alteration of dietary n-3 and n-6 fatty acids for the treatment of chronic headaches: a randomized trial. PAIN®. 2013;154:2441-2451. Leitzmann MF, et al. Dietary intake of n− 3 and n− 6 fatty acids and the risk of prostate cancer. Am J Clin Nutr. 2004;80:204-216. Simon JA, et al. The relation of α-linolenic acid to the risk of prostate cancer: a systematic review and meta-analysis. Am J Clin Nutr. 2009;89:1558S-1564S. Yang YJ, et al. Comparison of fatty acid profiles in the serum of patients with prostate cancer and benign prostatic hyperplasia. Clinical biochemistry. 1999;32:405-409. Carayol M, et al. Prospective studies of dietary alpha-linolenic acid intake and prostate cancer risk: a meta-analysis. Cancer Causes Control. 2010;21:347-355. Demark-Wahnefried W, et al. Flaxseed supplementation (not dietary fat restriction) reduces prostate cancer proliferation rates in men presurgery. Cancer Epidemiol Biomarkers Prev. 2008;17:3577-3587. Hedelin M, et al. Association of frequent consumption of fatty fish with prostate cancer risk is modified by COX‐2 polymorphism. Int J Cancer. 2007;120:398-405. Pham T-M, et al. Fish intake and the risk of fatal prostate cancer: findings from a cohort study in Japan. Public HealthNutr. 2009;12:609-613. Allen NE, et al. A prospective study of diet and prostate cancer in Japanese men. Cancer Causes & Control. 2004;15:911-920. Mills PK, et al. Cohort study of diet, lifestyle, and prostate cancer in Adventist men. Cancer. 1989;64:598-604. Joshi AD, et al. Fish intake, cooking practices, and risk of prostate cancer: results from a multi-ethnic case-control study. Cancer Causes Control. 2012;23:405-420. Chow CK. Fatty acids in foods and their health implications (3rd edn). CRC Press, Boca Raton, Florida, USA. 2007. Meyer B. Are we consuming enough long chain omega-3 polyunsaturated fatty acids for optimal health? Prostaglandins, Leukotrienes and Essential Fatty Acids (PLEFA). 2011;85: 275-280. Marangoni AG and Rousseau D. Engineering triacylglycerols: the role of interesterification. Trends Food Sci Technol. 1995;6:329-335. Pelliccia F, et al. Current evidence and future perspectives on n− 3 PUFAs. Int J Cardiol. 2013;170:S3-S7. Pirillo A and Catapano AL. Omega-3 polyunsaturated fatty acids in the treatment of hypertriglyceridaemia. Int J Cardiol. 2013;170:S16-S20. Agostoni C, et al. Scientific opinion on the tolerable upper intake level of eicosapentaenoic acid (EPA), docosahexaenoic acid (DHA) and docosapentaenoic acid (DPA). EFSA Panel on Dietetic Products, Nutrition and Allergies (NDA). 2012;10:2815. Jacobsen C. Enrichment of foods with omega‐3 fatty acids: a multidisciplinary challenge. Ann N Y Acad Sci. 2010;1190:141-150. FAO. Fats and fatty acids in human nutrition: report of an expert consultation. Food and Agriculture Organization of the United Nations, Geneva. 2010. Amine E, et al. Diet, nutrition and the prevention of chronic diseases: report of a joint WHO/FAO Expert Consultation. World Health Organization, Geneva. 2002;1-148. Cunnane S, et al. Recommendations for intakes of polyunsaturated fatty acids in healthy adults. ISSFAL Newsl. 2004;11:12-25. Koletzko B, et al. Dietary fat intakes for pregnant and lactating women. Br J Nutr. 2007;98: 873-877. Simopoulos AP. Summary of the NATO advanced research workshop on dietary omega 3 and omega 6 fatty acids: biological effects and nutritional essentiality. J Nutr. 1989;119:521-528. Koletzko B, et al. The roles of long-chain polyunsaturated fatty acids in pregnancy, lactation and infancy: review of current knowledge and consensus recommendations. J Perinat Med. 2008;36:5-14. Adarme-Vega TC, et al. Microalgal biofactories: a promising approach towards sustainable omega-3 fatty acid production. Microb Cell Fact. 2012;11:1. Brown MR. Nutritional value and use of microalgae in aquaculture. Avances en Nutrición Acuícola VI. Memorias del VI Simposium Internacional de Nutrición Acuícola. 2002;3:281-292. Mozzi F and Vignolo GM. Biotechnology of lactic acid bacteria: novel applications, Wiley-Blackwell, Oxford, UK. 2010. Hamilton ML, et al. Metabolic engineering of Phaeodactylum tricornutum for the enhanced accumulation of omega-3 long chain polyunsaturated fatty acids. Metab Eng. 2014;22:3-9. Hamilton ML, et al. Towards the industrial production of omega-3 long chain polyunsaturated fatty acids from a genetically modified diatom Phaeodactylum tricornutum. PLoS One. 2015;10:e0144054. Sakuradani E, et al. Identification of Δ12‐fatty acid desaturase from arachidonic acid‐producing Mortierella fungus by heterologous expression in the yeast Saccharomyces cerevisiae and the fungus Aspergillus oryzae. Eur J Biochem. 1999a; 261:812-820. Li Y-T, et al. Improvement of arachidonic acid and eicosapentaenoic acid production by increasing the copy number of the genes encoding fatty acid desaturase and elongase into Pichia pastoris. Biotechnol Lett. 2009;31:1011-1017. Jiang M, et al. Isolation and characterization of the diatom Phaeodactylum δ5-elongase gene for transgenic LC-PUFA production in Pichia pastoris. Mar Drugs. 2014;12:1317-1334. Chuang, LT, et al. Co-expression of heterologous desaturase genes in Yarrowia lipolytica. ‎NBiotechnol. 2010;27:277-282. Sakuradani E, et al. Metabolic engineering for the production of polyunsaturated fatty acids by oleaginous fungus Mortierella alpina 1S-4. J Biosci Bioeng. 2013;116:417-422. Kajikawa M, et al. Isolation and characterization of Δ6-desaturase, an ELO-like enzyme and Δ5-desaturase from the liverwort Marchantia polymorpha and production of arachidonic and eicosapentaenoic acids in the methylotrophic yeast Pichia pastoris. Plant Mol Biol. 2004;54: 335-352. Abu‐Ghosh S, et al. A novel source of dihomo‐γ‐linolenic acid: Possibilities and limitations of DGLA production in the high‐density cultures of the Δ5 desaturase‐mutant microalga Lobosphaera incisa. Eur J Lipid Sci. 2015;117:760-766. Okuda T, et al. Eicosapentaenoic acid (EPA) production by an oleaginous fungus Mortierella alpina expressing heterologous the Δ17‐desaturase gene under ordinary temperature. Eur J Lipid Sci Technol. 2015;117:1919-1927. Sakuradani E, et al. Δ6-Fatty acid desaturase from an arachidonic acid-producing Mortierella fungus: gene cloning and its heterologous expression in a fungus, Aspergillus. Gene. 1999b;238:445-453. Vadivelan G and Venkateswaran G. Production and enhancement of omega-3 fatty acid from Mortierella alpina CFR-GV15: its food and therapeutic application. Biomed Res Int.2014: 657414. Xue Z, et al. Production of omega-3 eicosapentaenoic acid by metabolic engineering of Yarrowia lipolytica. Nat Biotechnol. 2013;31:734-740. Amiri-Jami M, et al. Engineering of EPA/DHA omega-3 fatty acid production by Lactococcus lactis subsp. cremoris MG1363. ApplMicrobiolBiotechnol. 2014;98:3071-3080. Lenihan-Geels G, et al. Alternative sources of omega-3 fats: can we find a sustainable substitute for fish? Nutrients. 2013;5:1301-1315. Li MC, et al. Expression of Mortierella isabellina delta6-fatty acid desaturase gene in gamma-linolenic acid production in transgenic tobacco. Sheng wu gong cheng xue bao. 2003;178-184. Li MC, et al. Heteologous expression of Mortierella isabellina ∆ 6-fatty acid desaturase gene in soybean. J Genet Genom. 2004;31:858-863. Sayanova O and Napier JA. Transgenic oilseed crops as an alternative to fish oils. Prostaglandins, Leukotrienes and Essential Fatty Acids (PLEFA). 2011;85:253-260. Lai L, et al. Generation of cloned transgenic pigs rich in omega-3 fatty acids. Nat Biotechnol. 2006;24:435-436. Wanasundara UN and Shahidi F. Concentration of omega 3-polyunsaturated fatty acids of seal blubber oil by urea complexation: optimization of reaction conditions. Food Chem. 1999;65:41-49. Homayooni B, et al. Concentrations of omega-3 fatty acids from rainbow sardine fish oil by various methods. Int Food Res J. 2014;21:743-748. Pettinello G, et al. Production of EPA enriched mixtures by supercritical fluid chromatography: from the laboratory scale to the pilot plant. J Supercrit Fluids. 2000;19:51-60. Rajaei A, et al. Supercritical fluid extraction of tea seed oil and its comparison with solvent extraction. Eur Food Res Technol. 2005;220:401-405. Tengku-Rozaina, et al. Enrichment of omega-3 fatty acids of refined hoki oil. ‎J Am Oil Chem Soc. 2013;90:1111-1119. Ifeduba EA, et al. Enzymatic interesterification of high oleic sunflower oil and tripalmitin or tristearin. ‎J Am Oil Chem Soc. 2016;93:61-67. Marangonia LN and Akoh CC. Lipase-catalyzed modification of phospholipids: incorporation of n-3 fatty acids into biosurfactants. J Am Oil Chem Soc. 1993;70:125-128. Klinkesorn U, et al. Chemical transesterification of tuna oil to enriched omega-3 polyunsaturated fatty acids. Food Chem. 2004;87:415-421. Fernández-Lorente G, et al. Release of omega-3 fatty acids by the hydrolysis of fish oil catalyzed by lipases immobilized on hydrophobic supports. ‎J Am Oil Chem Soc. 2011;88: 1173-1178. McNeill GP, et al. Lipase-catalyzed enrichment of long-chain polyunsaturated fatty acids. ‎J Am Oil Chem Soc. 1996;73:1403-1407. Kim S-J and Kim HK. Production of omega-3 fatty acid ethyl esters from Menhaden oil using Proteus vulgaris lipase-mediated one-step transesterification and urea complexation. Appl Biochem Biotechnol. 2016;1-14. Li D, et al. A novel process for the synthesis of highly pure n-3 polyunsaturated fatty acid (PUFA)-enriched triglycerides by combined transesterification and ethanolysis. J Agric Food Chem. 2016;64:6533-6538. Marsaoui, et al. Incorporation of omega-3 polyunsaturated fatty acids into soybean lecithin: effect of amines and divalent cations on transesterification by lipases. World J MicrobiolBiotechnol. 2013;29:2233-2238. Chakraborty K, et al. Preparation of eicosapentaenoic acid concentrates from sardine oil by Bacillus circulans lipase. Food Chem. 2010;120:433-442. Hita E, et al. Production of structured triacylglycerols by acidolysis catalyzed by lipases immobilized in a packed bed reactor. BiochemEng J. 2009;46:257-264. Hosokawa M, et al. Preparation of therapeutic phospholipids through porcine pancreatic phospholipase A2-mediated esterification and lipozyme-mediated acidolysis. ‎J Am Oil Chem Soc. 1995;72:1287-1291. Park CW, et al. Transesterification of phosphatidylcholine with eicosapentaenoic acid ethyl ester using phospholipase A2 in organic solvent. Biotechnol Lett. 2000;22:147-150. Mutua LN and Akoh CC. Lipase-catalyzed modification of phospholipids: incorporation of n-3 fatty acids into biosurfactants. J Am Oil Chem Soc. 1993;70:125-128. European Food Safety Authority. Scientific opinion on dietary reference values for fats, including saturated fatty acids, polyunsaturated fatty acids, monounsatureated fatty acids, trans fatty acids, and cholesterol. EFSA J. 2010;8:1461-1566.